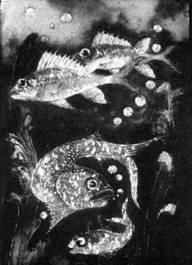 Frank Gardner Hale (1876-1945) was one of the earliest and most important metalcrafters in the Arts & Crafts movement. He was a student of C. R. Ashbee's in England, and later taught another of the movement's key figures, Edward Everett Oakes, who apprenticed in Hale's Boston studio. "Hale … trained at Norwich Art School, Connecticut, and the School of the Museum of Fine Arts in Boston. 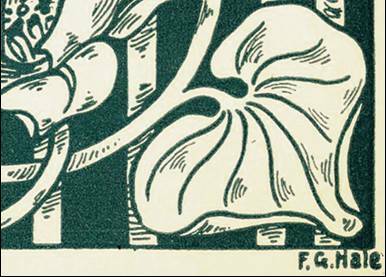 He worked eight years as a designer of book and music covers and book plates before he decided to devote himself to crafts and went to Chipping Campden in 1906 to join the Guild of Handicraft with C. R. Ashbee. After studying silversmithing and enamelling there, he went to London to work on jewelry with Frederick Partridge, who was considered by the Ashbees to be the most skillful jeweler of the Arts and Crafts Movement. Partridge had left Chipping Campden a few years before because of romantic complications. "Hale set up shop in Boston in 1907 and became a member of the Society of Arts and Crafts which had been established in 1897. He brought his artistic ability and training to the craft which up to that point had consisted of self-taught idealists whose work Bing of L' Art Nouveau in Paris called 'almost touching in its artistic poverty.'" In a 1923 biography of Hale in The American Magazine of Art, Henry Hunt Clark noted that Hale's "work met with quick recognition of its value:"
"In 1908 he was made a master by the Boston Society of Arts and Crafts, and he was given the Society bronze medal for excellence in work in 1915. He received a silver medal at the Panama Pacific Exposition at San Francisco and in 1917 the Frank Logan prize and bronze medal at the Exhibition of Applied Arts held at the Chicago Art Institute. 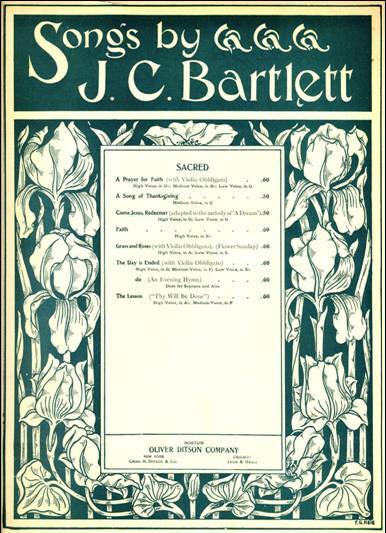 From 1910 to 1919 he served on the jury of the Society of Arts and Crafts, and now he is a member of its Council. Together with other jewellers he helped form the Jewellers' Guild, becoming its first dean, a position he has held since its organization." "From the first Frank Gardner Hale's work was technically sound, and much of the progress that has been made by other craftsmen has been due to his example and to his interest in raising the standard of the craft generally. To his studies abroad he had brought a well-trained hand and eye and a very individual manner of expression. Still it would not have been surprising had his early work been conspicuously English in character. 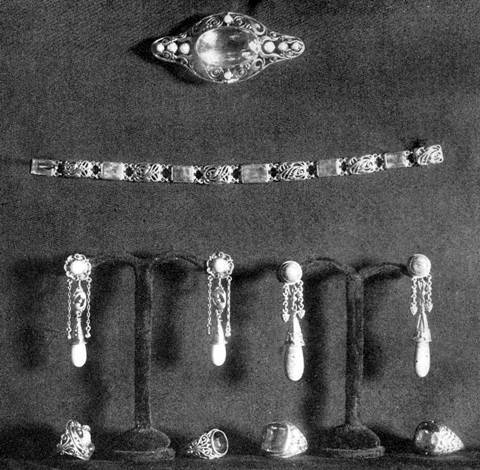 However, what he assimilated was not so much the peculiar decorative features characteristic of the work of his teacher -- very little of that, if any, was to be discerned -- rather the methods of good craftsmanship and the desire for technical perfection, and it is this that makes his jewelry so distinctive today. The character that marked many of his designs was quite often that of his previous work in black and white. Similar shapes of leaf, of flower, and curve of stem heretofore devised with pen and ink were now fashioned of new material. As his earlier art had been distinguished by precision the basic elements of construction may be those of the past, but the details and the forms which they take are new." "…the work is never bizarre; there has been no striving for novelty. What is new has come from his endeavor to perfect his work. Never duplicating, he has rearranged and developed his work so that it has become more highly organized in every respect. 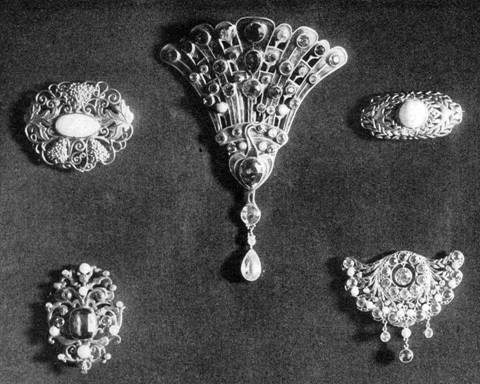 This development has come through a careful consideration of the stones employed, their shape, their form and color; whether they should appear in brooch, or pendant, or ring; what quality or quantity of metal should surround them to give them their full value. The choice of these surrounding elements as leafage or scroll, of flat or modulated surface, the play of dark and light given by parts of different scale or of varying surface treatment, the accentuation that may be added by the use of enamel in color or deep black, to make every detail take its proper place in the enhancement of the stone is his custom, and by this method of work has he produced so many pieces of great distinction." 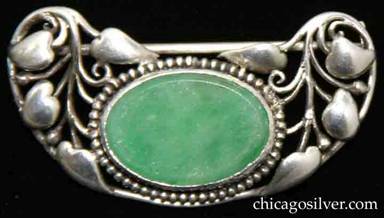 "Occasionally the problem has been to make a setting for a pendant of certain special stones, as, for example, pieces of Chinese jade or carnelian, themselves already carved, pieces which perhaps are now assembled for the first time. In this work Mr. Hale has been particularly successful, as out of the old material he has wrought a new design appropriate for present-day use. The pieces have needed mounting or framing, and for such constructive parts the designs upon the stones have supplied the motive of curve or shape, and all with cord or chain have been so harmoniously composed that the finished pendant seems as of one character. 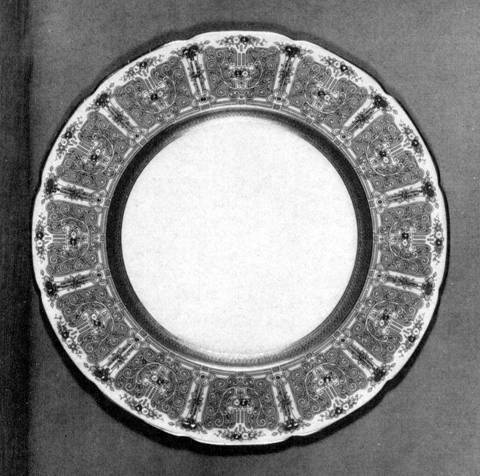 Service plate, designed by Frank Gardner Hale; executed by Lenox, Inc.
"His finest pieces, and those most wholly his, are quite abstract in form, made not by following ancient mode nor by reassembling ancient stones. This type of work has always interested him from the beginning, and out of the earlier arrangements of stone and ball and scroll, symmetrically made in rather static manner, have come pieces or highly developed structure. Groupings of colored stones, diamonds and pearls, of small bits of metal varied in tone, arranged in clusters, in lines, on radiating systems, he has organized and fashioned into jewelry of pure design. It is such work that gives Frank Gardner Hale an eminent place among the best of craftsmen." 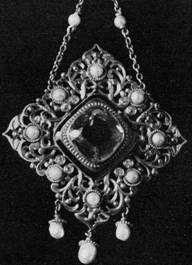 Curiously enough, it is in once Puritan Boston that there is now the largest number of artist jewelers. Of these the names of Frank Gardner Hale, Margaret Rogers and Josephine Hartwell Shaw are easily foremost. 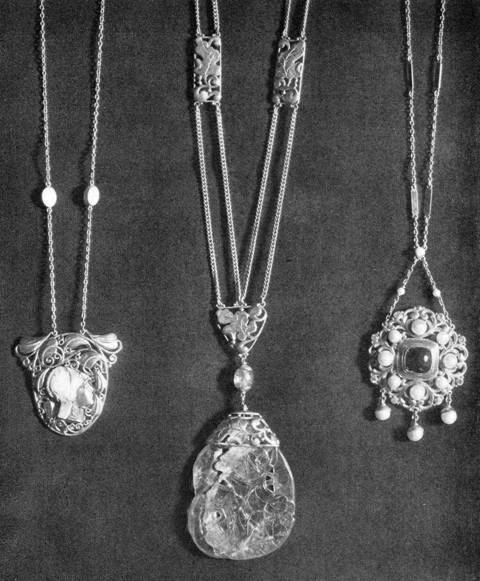 All three are master craftsmen in the Boston Society of Arts and Crafts, and have received the bronze medal conferred by the Society as its highest honor for excellence in the crafts... [Hale's] work has the sure touch of mastery, and in design and color is beautiful, with a sanity of treatment that makes it perfectly wearable. 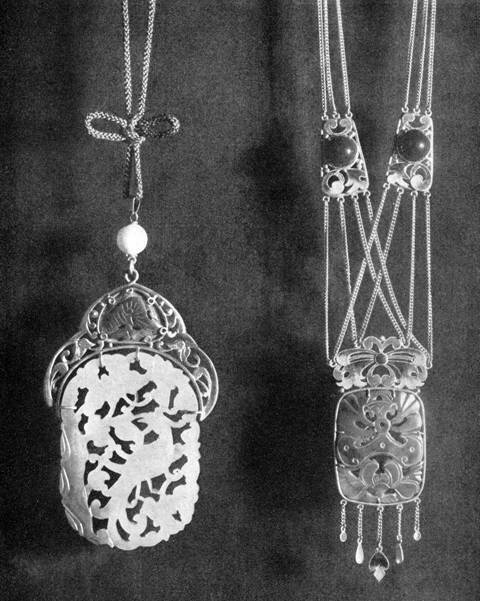 Known for his fine jewelry and enamels, Hale made each piece entirely by hand, which meant even fashioning his own wires for decorations rather than buying them from jewelry suppliers. Hale lectured extensively, and was a key figure in the guilds and organizations that flourished at the time. His jewelry remains highly sought after today. 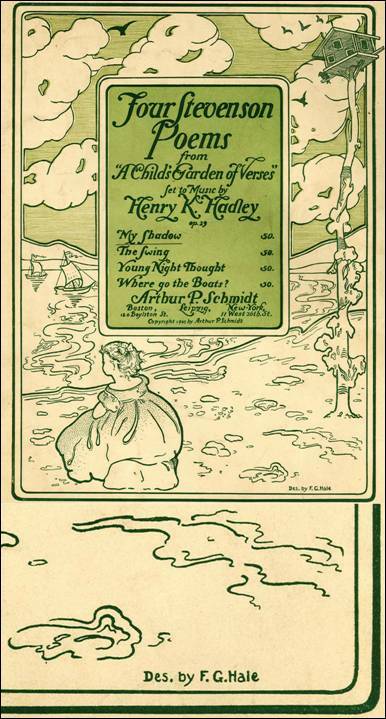 Hale initially designed book and music covers like the ones above before leaving for England in 1906 to join the Guild of Handicraft where he studied with C. R. Ashbee. 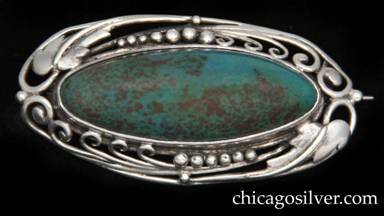 Brooch, oval frame in sterling silver with fine, detailed foliate work with handwrought flowers, beads and scrolls centering an oval, bezel-set opal in matrix cabochon. Brooch, gold, with lapis. Oval form with a ring of applied grape leaves, bunches of grapes, and curling wire decorations centering a large flat oval lapis stone with silver inclusions. 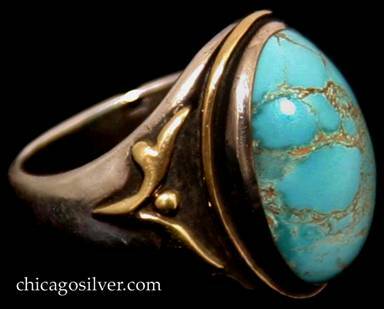 Ring, size 6, handwrought in sterling silver with 14K gold applied accents and large central turquoise with gold matrix cabochon. Heavy shank with simple stylized leaf and bead design on oxidized surface. 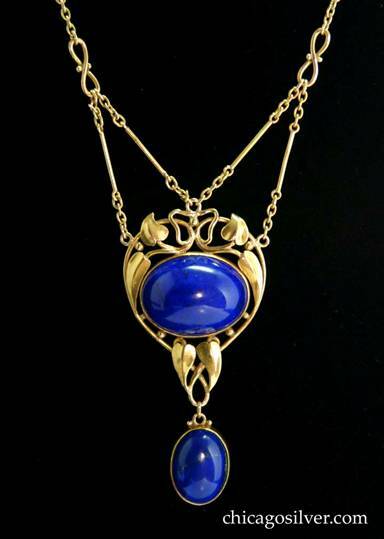 Pendant on chain, 18K gold, with lapis. Nouveau-style thick continuous shield-shape gold wire frame forming small loop at bottom and two loops at top with small butterfly-shaped wirework between them. 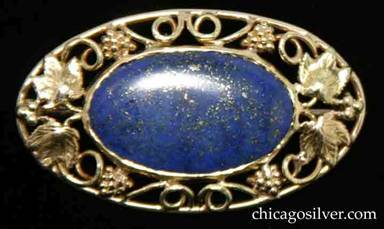 Applied elongated leaves top and bottom and curving down the sides, centering a large horizontally mounted and very dimensional bezel-set oval deep blue cabochon lapis stone, with gold beads securing it to the frame. Suspended from the bottom loop is a matching vertically mounted and dimensional bezel-set oval deep blue cabochon lapis stone drop, with gold beads adjacent to the small bale. The pendant is mounted on a handwrought gold chain composed of links, bars, and wirework figure-eight loops, and is fastened to the top of the pendant in four places in an "M" shape. A stunning and impressive piece. 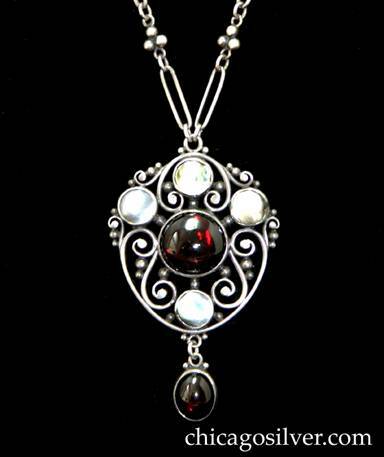 Pendant on chain, stylized shield form frame with handwrought sterling scrolls and beads with a round, central garnet cabochon with three bezel-set blister pearls above and one below finished with a garnet drop. Original paper clip chain with oval links alternating with 3 bead clusters, toggle clasp. Box, copper, rectangular, on four small applied feet at the corners with curved edges, hinged overlapping lid with rounded corners and large enameled rectangular domed insert in excellent condition. 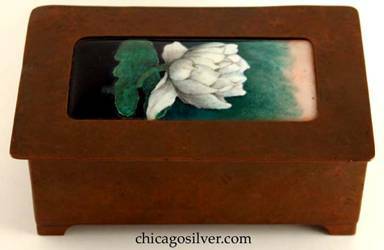 Enameled decoration is detailed creamy white water lily blossom above rich green leaf, on background that varies from deep black at the bottom to mottled green and then light rose at the top. Nicely hammered. Very heavy and lovely.